India experienced a major structural change with the enactment of the Insolvency and Bankruptcy Code, 2016 (IBC). Since its enactment, India's ranking under the Insolvency head in the World Bank Group's Doing Business report has sharply risen from 136 to 103, attracting international attention. Yet, as per IBBI data, till end of September 2018, only 20% of the cases admitted were successfully resolved under IBC, while 80% ended up in liquidation. And now, even the constitutionality of IBC is under serious challenge before the Supreme Court of India for discriminating against operational creditors. In view of these contemporary challenges facing IBC, my paper titled Value destruction and wealth transfer under the Insolvency and Bankruptcy Code, 2016 argues that many of these challenges fall within two conceptual categories - the value destruction problem and the wealth transfer problem. The paper uses the law and economics literature on insolvency to identify the potential sources of these two problems within the IBC. A well-designed insolvency law should help in correctly determining if an insolvent business is suffering from financial distress or economic distress. A business is financially distressed when total value of its debt exceeds its net present value. Insolvency law should facilitate a going-concern sale or restructuring of a merely financially distressed business. But a financially distressed business could also suffer from economic distress - the net present value of the business could be less than the total value of the assets of the business were they to be broken up from the business and sold separately (break-up `liquidation value'). In such cases, insolvency law should facilitate liquidation, whether through a going-concern sale or a break-up sale. A poorly designed insolvency law could inadvertently push a merely financially distressed business into liquidation, causing value destruction. Value destruction could also happen due to delayed restructuring. I refer to these as Value Destruction Problem (VDP). VDP could arise under IBC. Secured financial creditors comprising the super-majority (i.e. 66%) in the Committee of Creditors (CoC) may not necessarily have the right incentives to sustain a merely financially distressed, but not economically distressed, company. This is because the secured creditors are not entitled to going concern surplus. Instead, such creditors are likely to have a stronger incentive to immediately liquidate the financially distressed company and realise the liquidation value, thus destroying the going concern surplus of the company. To illustrate, let's consider a hypothetical example. Suppose a company has two types of creditors - secured financial creditors and unsecured operational trade creditors. It owes USD100 to its secured financial creditors, USD30 to its unsecured operational trade creditors, and the liquidation value ('L') of the company is USD90. If the company is continued as a going concern for next 6 months, there is a 0.5 probability that in good state ('G') it will be worth USD200 and a 0.5 probability that in bad state ('B') it will be worth USD40. In other words, if the company is continued for the next 6 months, the expected going concern value of the company would be USD (0.5). (200) + (0.5). (40) = USD120. Assuming discount rate to be zero (for simplicity), since the net present value (USD120) is higher than the liquidation value (USD90), the company is not economically distressed. It is only in financial distress because the total debt of the company (USD130) exceeds its net present value (USD120). Therefore, the value maximising option would be to keep the company going, so that both the financial and operational creditors can recover a total of USD120 as against only USD90 if the company is liquidated. However, if things go well and after 6 months the company is actually worth USD200, the secured financial creditors will still get only USD100, the value of debt owed to them. On the other hand, if things go badly and after 6 months the company is actually worth USD40, they will get the entire USD40. Therefore, the expected return for secured financial creditors would be USD (0.5). (100) + (0.5). (40) = USD70 - much lesser than what they would get in liquidation (USD90). Therefore, the secured financial creditors comprising the CoC would rationally prefer to liquidate the company for USD90, although ideally the company should have been sustained to get USD120. Looked at from this perspective, IBC suffers from VDP. When insolvency law provides cramdown powers to majority claimants to facilitate restructuring, it raises the possibility of abuse. Majority claimants in control over the restructuring of the corporate debtor may be able to advantage or disadvantage different groups of beneficiaries by structuring of the securities, contract rights or other property received by each. They could even abuse this control to derive disproportionate private benefits by transferring wealth away from the dissenting minority claimants through the restructuring plan. Wealth transfer could also happen if valuation of the corporate debtor is left to one particular class of creditors. Senior creditors have an incentive to undervalue the company's business, while junior creditors have an incentive to overvalue it. I refer to these as Wealth Transfer Problem (WTP). The IBC empowers majority financial creditors with 66% vote by value in the CoC to impose a resolution plan on the dissenting minority financial creditors as well as the non-voting operational creditors. However, it does not provide proportionate protection to dissenting financial creditors. Till October 5, 2018, IBC regulations required the resolution plan to identify specific sources of funds to pay the `liquidation value' due to dissenting financial creditors. On October 5, 2018, this minimum protection was removed. Therefore, currently there is no specific provision under the statute or regulations to protect dissenting financial creditors from potential wealth transfer by abusive use of cramdown powers by majority financial creditors. Further, the IBC overlooks a basic distinction between restructuring and going concern sales. Restructuring, being a hypothetical sale of the corporate debtor's business to the claimants of the corporate debtor, some finite notional value has to be placed on the business of the corporate debtor. Therefore, restructuring requires a valuation benchmark, according to which the rights of each claimant in the restructured business has to be determined. No such problem arises in a going concern sale for cash to a third party after proper marketing exercise. Consequently, no such valuation benchmark is necessary for a sale transaction. However, the IBC uses the liquidation valuation benchmark to protect operational creditors in both restructuring as well as sale transactions. This creates opportunities for wealth transfer from operational creditors in sale transactions under IBC. To illustrate, assume that a corporate debtor has entered insolvency resolution process under the IBC. It has a going concern value of USD130 and break-up `liquidation value' of USD110. The face value of debts owed to its financial creditors is USD100 and to its operational creditors is USD30. If the company is liquidated on break-up basis, then the financial creditors would get USD100 and the operational creditors would get only USD10. However, if the company is sold for cash to a third party at going concern value, then the financial creditors could get USD100 and USD30 will be left over. Applying the creditor protection rules under the IBC, the financial creditors could approve a resolution plan that provides only the break-up liquidation amount (USD10) to the operational creditors and the remaining USD20 to the lower claimaints like shareholders. This would effectively amount to a wealth transfer from the operational creditors. Looked at from this perspective, IBC suffers from WTP. Recently, the NCLAT in the Binani case tried to solve the WTP by taking an extreme position. It held (para 48) that a resolution plan must not discriminate against dissenting financial creditors or non-voting operational creditors. This broad non-discrimination principle developed by NCLAT is problematic. It could be misused by out-of-the-money minority financial creditors or non-voting operational creditors to engage in hold-up strategies to extract a better deal for themselves, causing wealth transfer from the majority financial creditors. Additionally, an increase in hold-up costs and coordination costs could in turn result in value destruction. It is rather ironic that in a bid to resolve the WTP under IBC, the Binani ruling could end up creating avenues for further WTP as well as VDP. Solving the contemporary challenges emanating from the VDP and the WTP under IBC would require deeper policy thinking. Indian policymakers need to take into account the root causes of these problems, as highlighted in this paper. Ultimately, the fundamental legislative design choices underlying IBC may need to be revisited. Pratik Datta is a Researcher at the National Institute of Public Finance and Policy. Health facilities offer the first line of response in any disaster. Damage to hospitals impedes long-term recovery of victims. The recent floods in Kerala highlighted the frailty of health systems. The flood damaged a 125-year-old hospital that serves 3.5 lakh people. This was similar to the Chennai floods (2015) where 18 patients died due to a hospital power failure. The Gujarat earthquake (2001) collapsed a 281-bed civil hospital leading to 172 deaths. Such losses and lapses in health infrastructure are not a recent problem in India. Then, how are Indian states formulating plans to make their hospitals resilient? The governance response to manage natural disasters in India is the Disaster Management Act 2005. The Act requires state governments to formulate state disaster management plans (SDMPs) to detail how to prepare, mitigate, respond and recover from disasters (Section 23). A component of these plans is medical preparedness and mass casualty management. When both time and resources are constrained, these SDMPs are essential for knowledge transmission to enable faster decision making. We review SDMPs of Indian states to study the inclusion of guidelines for disaster management of health facilities. We utilized two recognised guidelines for resilient hospitals to review the SDMPs: 1) WHO indicators; and 2) India's national guidelines for hospital safety. In 2010, the World Health Organization (WHO) laid down indicators for "Safe Hospitals in Emergencies and Disasters". The indicators are made for countries to assess the vulnerabilities of existing health facilities and upgrade them to ensure continuous operations. WHO organises the indicators into three assessment checklists: Structural, Non-Structural and Functional. Countries are required to adapt actions in these checklists to suit their local context and protocol. Structural: Indicators that enable the facility itself to withstand the shock from disasters such as design and engineering standards, location, compliance with fire codes and building materials. Chosen indicators (2): Design codes; location/ land use. Non-structural: Indicators for the smooth functioning of the facility following a crisis such as a lifeline equipment, architectural elements, service installations, handling of hazardous substances and general security of the facility. Chosen indicators (1): Safety checklists. Functional: Indicators that enable the facility to be fully operational to respond during disasters such as emergency procedures, site accessibility, communication and monitoring systems. Chosen indicators (8): Equipment and supplies; Plans for emergency and disaster: Contingency Plan, Medical Preparedness Plan, Psycho-social care and mental health, Hospital networking, Mass casualty management; Human Resources: Emergency teams, training, and drills. Others: Indicators not part of the WHO guidelines but present in most SDMPs to enable better management of health resources during a disaster. Chosen indicators (8): Mobile hospitals; Media; District level data; Capacity of facilities; Standard Operating Procedures (SOPs) of departments in charge; GIS; list of hospitals; Use of National and State Disaster Resource Network (SDRN). We studied SDMPs of 24 states that were available in the public domain on websites of State Disaster Management Authorities or allied departments (such as the Revenue Department). The plans were text mined for keywords related to health like "hospitals", "health", "medical" and "casualty". Each paragraph containing any of the keywords was then evaluated against the above indicators to check for actions/guidelines for compliance. For each indicator addressed, one point was assigned to that plan document. The resulting scores are tabulated in this SDMP scoreboard spreadsheet. 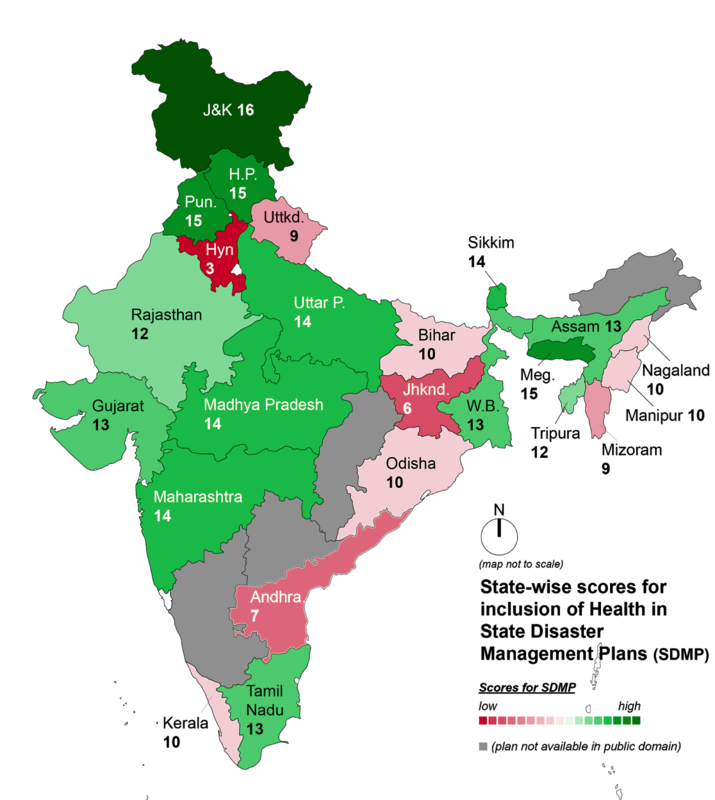 A map of India with state scores is presented below in Figure 1. Structural indicators: Structural indicators are the most communicated and find mention in 75% of the documents. E.g. Himachal Pradesh mentions that 48% of its medical institutions are located in highly vulnerable districts and must comply with codes of the Bureau of Indian Standards (BIS). Punjab recommends assigning a quality auditor agency to monitor construction in seismic zones 3,4 and 5 (medium to very high earthquake risk). Non-structural indicators: Non-structural indicators are the least addressed in all documents. Less than 50% refer to even one of the indicators from the WHO Safe Hospitals indicators. Points on the safety of medical equipment, furniture, backup supplies are mentioned as part of larger checklists for response but most do not provide actionable points. The plans do not refer to any other universal guidelines that hospitals may follow for the safety of non-structural aspects. Functional indicators: Functional indicators find a mention in 75% of the documents. All states recommend the preparation of a medical preparedness plan, mass casualty management plan and checklists to train health workers for emergencies. An essential requirement to enable functional continuity of hospitals during emergencies is a list of all available health facilities and supporting services (such as power station, police station, ambulances). A mere 45% of documents provide any information on health facilities in the state. Odisha highlights provisioning of a dedicated high tension power line to the district headquarters hospitals for uninterrupted communication with the health control room. Assam: Study on the multi-hazard safety aspect of schools, hospital buildings in Guwahati City along with retrofitting solutions. Gujarat: Safety audit of hospitals. Jammu and Kashmir: Vulnerability assessment of hospitals; promote hazard resilient construction; and implement a disaster preparedness plan for hospitals. Uttar Pradesh: Medical database for health facilities; resource management and identification of a medical incident command system. The level of detail of a State Disaster Management Plan did not seem proportional to the disaster proneness of the state. Flood and earthquake-prone Uttarakhand, flood-prone Bihar and the recently flood-ravaged Kerala fair below average on the scoreboard. The collapse of the civil hospital during the Bhuj earthquake triggered the last revision of the Indian Seismic Code for Earthquake Resistant Design of Structures (IS 1893: 2002). This has also improved the inclusion of structural indicators in most SDMPs as there is both legal mandates and evolved guidelines for health facilities to comply to. Non-structural indicators have few or no guidelines in India. The NDMA guidelines on Hospital Safety (2016) elaborates on this in detail. But as a relatively recent document, it has not seen adoption in SDMPs yet. This needs more attention while formulating plans as non-structural safety includes a spectrum of indicators for equipment safety, power/water supply backups, architectural elements, fixtures, electrical installations etc that are essential to reduce service disruptions. Functional indicators such as post-disaster psycho-social support and mental health find a mention in more than half the documents but Meghalaya is the only state with a detailed guideline. At least one-third of the survivors of the super-cyclone in the state of Odisha suffered disabling psychiatric symptoms. NDMA has recognised this issue as "a continuum of the interventions in disaster situations" and laid down guidelines on Psycho-social Support and Mental Health Services (PSSMHS) in Disasters (2009) that states may follow. While plans alone will not determine the quality of response to a disaster, lack of a well-drafted plan will reflect in poorly implemented practices when both time and resources are limited. In comparison with global frameworks, India's SDMPs need to improve inclusion of non-structural and functional indicators to better guide the resilience of health facilities. Our study pushes for the creation of a systematic methodology to evaluate plans to start filling these gaps. This mainstreaming of resilience is essential to reduce the negative consequences of a disaster and promote overall well-being. This is achievable through a systematic regulatory framework to evaluate and improve state disaster management plans and assign a value to documented processes. Link to State Disaster Management Plans (SDMP) utilized for this study. Link to the evaluation SDMP scoreboard spreadsheet. Link to the extracted lines relating to health from all State Disaster Management Plans. EM-DAT. Emergency Events Database by Centre for Research on the Epidemiology of Disasters (CRED), Accessed on September, 2018. ADB 2005. India Post Tsunami Recovery Program Preliminary Damage and Needs Assessment by Asian Development Bank, United Nations and World Bank, March 2005. BIS 2002. Indian Standard Criteria for Earthquake Resistant Design of Structures IS 1893 (Part 1): 2002 by Bureau of Indian Standards, June 2002. Gupta 2000. Cyclone and After: Managing Public Health Meena Gupta, Journal Article, Economic and Political Weekly, 2000.
WHO 2010. Safe Hospitals in Emergencies and Disasters, Technical Report, World Health Organization, 2010. NDMA 2016. Guidelines: Hospital Safety, National Disaster Management Authority, Government of India, 2016. IPHS 2012. IPHS Guidelines for District Hospitals, Indian Public Health Standards, Guidelines, 2012. GHI. A disaster safety checklist for hospital administrators by GeoHazards International. GoI 2005. Disaster Management Act 2005, Government of India, 2005. NDMA 2007. Guidelines: Preparation of State Disaster Management Plans. National Disaster Management Authority, Government of India, July 2007. Supriya Krishnan is a consultant with the United Nations Office for Disaster Risk Reduction and was previously a researcher at the National Institute for Public Finance and Policy. The author would like to thank Shubho Roy for valuable feedback and guidance through the writing of this blog. by Ajay Shah and Susan Thomas. In 2016 and 2017, we wrote `State of the art' articles on the Indian bankruptcy reform. This article presents the third in this series, the state of the art as we see it in 2018. A few anecdotes about IBC at work are high in the public imagination. The takeover of Bhushan Steel by Tata Steel was an unexpected output in nearly all elements of the insolvency. Bhushan Steel is a plant with a capacity of 5 million tonnes of steel per annum which was producing 3 million tonnes per annum under financial distress. Under the new management, it is expected to produce 5 million tonnes of annum. The recovery rate for creditors was an impressive 63%. Unsecured bond holders, expecting nothing, received significant cash. Another surprising resolution was that of Sharon Bio Medicine, where the unsecured creditors got close to 98% of their dues. Some cases have been unpleasant surprises. Those that stand out include Binani Cement, Essar Steel, Jaypee Infratech. Inputs: Laws (both Parliamentary law and subordinate legislation), the institutional infrastructure that is required for the IBC to work, and capabilities of various private persons. Outputs: Transactions that go through the system and the performance of all parties that come together to make these transactions happen. Outcomes: Recovery rates, the growth of credit and the rise beyond simple secured credit, and the deeper changes in behaviour by private persons who borrow and lend. All these agents re-optimise their strategies based on their perception of the working of the bankruptcy process. Outputs: How much time do cases take? Survivor function after a case is admitted at NCLT. Source: IGIDR FRG. The graph above shows the `survivor function' of cases that are admitted at NCLT on date 0. At date 0, the survivor function takes the value 1, which means that 100% of the cases are pending. As time flows forward, some insolvencies are resolved. The cases that are still pending are the `survivors'; the survivor function shows the fraction of cases that are not resolved. The IBC intended that cases would ordinarily be completed in 180 days. We see that by 180 days, there is a probability of about 0.9 that a case is not resolved. The IBC intended that under special cases, cases could survive to 270 days. 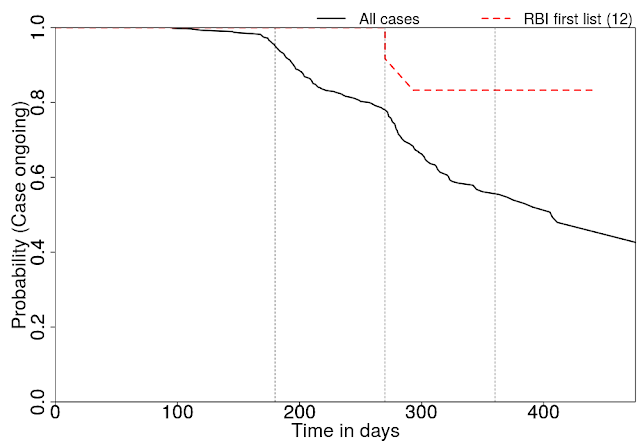 If the IBC was implemented correctly, the survivor function would be down to 0 by 270 days. 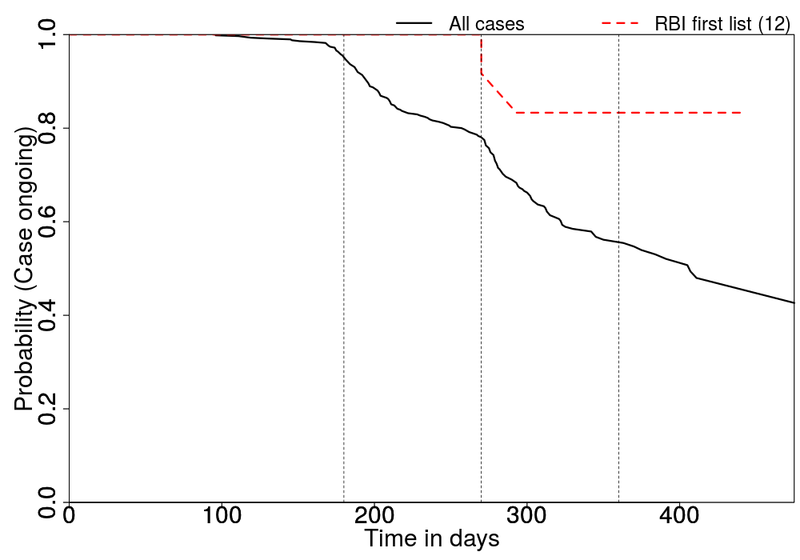 We see that by 270 days, there is a probability of 0.8 that a case is not resolved. Things are more challenging when it comes to the biggest cases. The dashed red line shows the RBI-12 firms. For these firms, none was resolved in 180 days and at 270 days, the survivor function had reached 0.9. While 180 or 270 days may appear to be arbitrary cutoffs, they were enshrined in the Act and this should matter. A casual examination of the survivor function does not even show a kink at 180 or 270. If, instead, we want to simply apply common sense, and wonder about what gets done in the first year after a case is admitted, the answer is: about half of all cases are resolved. But when it comes to the RBI-12, about 90% of the cases are pending, one year after admission. From 2015 onwards, it has been clear that pulling off the IBC reform is a complex puzzle. By 2018, we are able to compute this survivor function of admitted cases, and we see that there is a problem. First case where interim financing is obtained? Not known. There is no public data about interim financing. First vote by a creditors' committee? Not known. There is no public data about what happens in the IRP. First case to complete IRP with a super-majority in favour of a restructuring plan? First case where the promoters are ejected? Innoventive Industries. This is a guess, as the relevant documents about the bankruptcy process are not released. First case to commence liquidation? Bhupen Electronic on 7th August 2017. First case to complete liquidation? First individual insolvency that commenced? The IBC is delivering poor outputs. Particularly with large firms, the institutional arrangements do not deliver rapid resolution. There is increasing gloom surrounding the bankruptcy process for large firms. When enough money is at stake, it is efficient for persons to spend millions of rupees of lawyers per year, and obtain delays through litigation. While this is the case, the IBC is delivering important gains, outside the public eye: It is reshaping the behaviour of borrowers. Shareholders of many stressed firms would sell off the business, or obtain fresh equity capital, at an early stage of distress, when they know how things are going to work out under IBC. There is anecdotal evidence that firms are behaving better with regard to financial and operational creditors, now that the threat of IBC is in the picture. The IBC helps set the stage for a better renegotiation between the borrower and the lenders. These gains are among the desired outcomes of the bankruptcy reform. Since they tend to be invisible to the public eye, they tend to generate no news stories. For this reason, the gains for India owing to the bankruptcy reform tend to be understated. One area where this learning by Indian promoters may be seen in the quick negotiations and settlement of cases after an IBC filing. This is seen in the FRG Insolvency Cases Dataset : Of the 830 cases for which were final orders were passed by the NCLT till 30 November 2017, 137 were dismissed as settled. We should focus on how the incentives of promoters are changed. For these agents, the important issue is: Will we be harmed if we default?. The IBC is likely faring well on this, even if only a small fraction of large cases are resolved in a year. In this thinking, it is important to distinguish between the stock of defaulted firms and a decision made from today onwards about default. For the stock, IBC induces fresh thoughts in negotiation for all parties. For the future, borrowers see their prospects after default, and are less likely to default. Amendments to the law have been energetically pushed out. A first amendment was in January and a second in August of 2018. But the law remains a work in progress in many ways. Gaps between the text of the law and the design principles of the BLRC continue to cause problems in the other elements listed ahead. Further, some of the amendments have become the source of new problems in the smooth functioning of the law. Three major issues concern the inclusion of home buyers as financial creditors, the change in the threshold of cramdown from 75 percent to 66 percent, and the 29A amendments ruling out the debtor from providing a resolution plan during the Insolvency Resolution Process. A short while after the first 12 large cases came into the IBC, Section 29 was modified to keep the promoter out of the resolution process. Under the new arrangement, promoters know a lot about the business and lack incentive to give this knowledge to new owners. This is value destroying (Choudhary, 2018). Further, promoters may have little incentive to preserving value once it becomes clear that a firm is headed towards default. In the extreme scenario, promoters may accelerate cash extraction if they see a world where theft goes unpunished and default leads to a loss of control of the company. At the same time, participants in the IRP are unlikely to compete with the promoter, so keeping the promoter at a distance from the IRP may give confidence to others who are interested in taking over the enterprise. In the BLRC design, it was important to differentiate between promoters who were guilty of theft and fraudulent practices from those who were not. However, there has been little focus on the provisions where the resolution professional can identify fraud in the accounts of the firm, which should have been a pathway to debar the promoter from any further involvement with the stressed firm. Conceptual thinking on the exclusion of promoters from the bankruptcy process came out after 29A was enacted (Feibelman and Sane, 2017; Sengupta and Sharma, 2017; Shah, 2017). As argued by these articles, 29A has given unanticipated effects, and an escalation of delays in the bankruptcy process. Private detectives all over India are ferreting out family connections and defaulted businesses of the Indian business elite. This section has become a tool for competitors to hinder the resolution of a distressed company. Many amendments of the law, such as 29A, are based on practical considerations and lack conceptual coherence or grounding in the empirical evidence. The desire for good outcomes, at the level of one anecdote at a time, has given bad outcomes on the overall distribution. An example of this lies in the tension between recovery rate in one particular case versus the sanctity of process. We have been too quick to jettison the sanctity of process. While this may seem nice at the level of a certain case, it undermines the incentives of participants to take the IBC process seriously, and to commit long-term resources in their participation (Shah, 2018). The law required four new elements of institutional infrastructure to become operational. Given such a burden of requirement, it is quite a remarkable feat of implementation that within six months of the law being passed, the first cases were being filed under this new law. The adjudication authority, the National Company Law Tribunal, was already in place by the time that the law was passed. So, the front-runner in institutional development was the Insolvency and Bankruptcy Board of India, IBBI, which was up and running on the 1st of October, 2016. After that, came the Insolvency Professional Agencies, IPAs, and the Insolvency Professionals, IPs. The Information Utilities or the IUs, are yet to make their presence felt. The regulator has been one of the four institutions under the law that has performed well in its startup phase. But now that this phase is behind us, there is a need to strengthen institutional capabilities and feedback loops between the regulator and the rest of the insolvency ecosystem (Khurana, 2017). The checks and balances described in Roy et. al. (2018) need to be put into the law to ensure accountability. The regulation-making process needs to rise from fire-fighting and practical thinking and to evidence-based and research-based thinking. IBBI is at the Indian frontier, on the sound working of regulators, by binding itself to a sound regulation-making process. At the same time, a research-driven regulation-making process requires a commensurate statistical system and a research community, both of which are at present lacking. The IPA industry is still to establish itself as a competitive industry, where the IPA plays a regulatory role. The BLRC had visualised the IPAs would play a regulatory function that is akin to what NSE and BSE do in the brokerage industry, and this has not arisen. The IBBI has recognised the difficulties and is now exploring the SEBI approach to financial market infrastructure institutions. On the other hand, a large IP industry has developed, with IPs often being placed into complex situations that they are poorly prepared for. As an example, Shrivastava, 2018, brings back remarkable tales from the field, where learning by doing is taking place. However, in the absence of IPA capability, IPs remain largely unregulated. The relationship between the Committee of Creditors, IPs and promoters have not yet been clarified in the minds of all three kinds of participants. The IPs have often been deferential to promoters. Under the IBC, the IP is supposed to choose whether to conduct a forensic audit, to look back in the recent two years for malfeasance in the form of cash extraction from the business. There is little evidence of IPs having done this. We are able to see one example: The IP of Binani Cements conducted a forensic audit into the affairs of the company and has filed an application before the NCLT alleging diversion of funds by promoters (Lavi, 2018). Since IBBI was constituted, no IPA has taken action against an IP, and only 4 final orders have been passed by its Disciplinary Committee. The Information Utilities are an important institutional feature of the law that has yet come into being. Participation in this industry has been hobbled through restrictions in regulations and concerns about legal liability of the IU. The block of Parliamentary law required for the IU industry to work properly has not come about. While the BLRC had envisioned a private, competitive IU industry, there are attempts to create a monopoly IU by the RBI (Regy, 2017). Public sector monopolies tend to work poorly and the attempt to establish a Public Credit Registry can further derail the nascent IU industry. The block of Parliamentary law required for the NCLT to work properly has not come about. As a consequence, the NCLT has taken shape like a conventional Indian tribunal. The case load has started generating a back log and delays at NCLT, due to capacity constraints. The BLRC vision was for the adjudication to not engage in commercial decisions during the process of insolvency resolution. NCLT, and amendments to the law, are bringing NCLT back into commercial decisions (Datta and Sengupta, 2017; Feibelman, 2018). The NCLT and other courts have now begun using their adjudication powers to favour resolution as opposed to liquidation; re-bids are being allowed and even resolution is being given another chance. This is a disruption for the efficiency of the bankruptcy process. The NCLT has also taken the view that piecemeal sale of assets is not allowed even though the IBC does not expressly prohibit such a practice. Before the relevant amendments were brought in, the Supreme Court (and even NCLTs) was allowing settlement of cases after admission, something that was not provided for under the IBC as it existed. Each such event creates a flawed jurisprudence, and harms the objectives of the Indian bankruptcy reform. Three of the four institutions under the IBC took off at an admirable pace. However, under the combination of being tasked to deal with cases not under its domain (such as the defaults to home buyers which would have been more optimally dealt with under the Real Estate (Regulation and Development) Act, 2016) or with large cases in its infancy (such as the large 12 cases that the RBI placed into the IBC in 2017) and being inadequately resourced to deal with this jump in workload, the institutions are predictably beginning to show delays in performance. The lack of organisational capacity in banks, to make decisions, persists. Process failures are apparent when representatives of public sector banks claim to have no final decision making authority at meetings, a carry-over from their role during the CDR scheme process. As a result, they abstain from voting. In extreme circumstances, there have been votes by these representatives that are not upheld by their managements. The IBBI has tried to allay this concern by imposing an obligation on the resolution professional to ensure that only authorised representatives are present at the creditor meetings. It is yet to be seen how much the financial creditors cooperate with the resolution professional. Banking regulation continues to be an important constraint shaping the behaviour of banks on the Committee of Creditors (CoC). A resolution plan that delivers value of anything less than what the bank is presently carrying as the asset value in its books, is likely to be rejected. The RBI continues to coerce banks to use the IBC, but this is the wrong solution (Zaveri, 2018). The February 2018 diktat by the RBI which requires cases with more than aggregate exposure of Rs. 20 billion and above to be compulsorily referred to IBC after 180 days of failed negotiations is another coercion that does not centrally address the incentive problems created by banking regulation. Instead, more technically sound regulation at RBI is essential, where assets are always marked down sharply, so that the bank looks forward to the (small) payout from the bankruptcy process as a source of new net profit. If banking regulation forces a bank to write down a Rs.100 loan to 0, then the bank will vigorously pursue obtaining (say) Rs.10 in the insolvency resolution process. Without it, a bank dominated CoC will end up providing tacit support for any alternative to accepting a market price that is lower than regulatory valuation -- and the easiest option is delay. Auctions are not an appropriate mechanism for collective resolution. A consequence of bank dominated creditor committees is an excessive attempt to reduce decision making into a formulaic process, close to the procurement processes followed by the government. As an example, IBA has come out with a bid evaluation matrix. Such a framework has a focus on a single number quoted by the bidder in an auction (Mehta, Sinha, 2018). Auctions are important during the liquidation stage, but not in resolution (Doshi, 2018). Auctions work well in cases with low complexity of credit structures. But the typical insolvency case will have complex financial obligations and asset structures. While the public sector bank dominated committees will take comfort that a standard procedure will rescue them from potential CVC scrutiny later, the use of such a mechanical procedure is likely to deliver sub-optimal business outcomes. Ironically, such outcomes increase the chances of a future inquiry. This problem is not a feature of public sector banks only. Matters have been made harder through a Supreme Court ruling in February 2016 that employees of private banks will be treated as `public servants' for the purposes of the Prevention of Corruption Act. This has made private bank employees behave more like public servants. Auctions may be an appropriate mechanism for individual corrective action. If a public sector bank is unable to engage in commercial, speculative, forward-looking thinking, better outcomes will be obtained by selling off distressed debt through auctions. Unlike the complexity of the commercial decisions that a member of the CoC has to take, the sale of distressed assets can be the outcome of of simply running an auction and choosing the highest bidder. Here too, banking regulation may hold the key. If a stressed loan of Rs.100 is marked down to 0, and a bank sees an up side potential of Rs.20 by selling off the loan versus an up side potential of Rs.10 by going onto the CoC itself, then rationality will prevail. If, on the other hand, the regulatory valuation of the asset (in this example) is Rs.30, then the best strategy for the bank is to do nothing. The present legal framework constrains the sale of stressed bank loans only to the Asset Reconstruction Companies (ARCs), who in turn have to hold a fixed fraction (15 percent) of these assets in their book. There are a limited number ARCs, holding a limited amount of capital that is available to purchase stressed loans. This increases the cost of a resolution both because of higher delays (going through an ARC will necessarily increase the time taken to participate) and higher costs (a transaction through an intermediary introduces an additional layer of cost, compared to directly transaction with the debt holder). A standard approach taken during the IRP is to aggregate a sufficient base of the credit, so as to control and manage the decision of the committee of creditors. There appears to be significant uncertainty in what constitutes the liabilities of the stressed entity, which in turn decides the weights that various creditors hold in the committee of creditors. For example, IDBI Bank which was a creditor in the Binani Cements IRP had their weights in the committee of creditors adjusted upwards at a significantly advanced stage of the bidding process. This creates delays and deters outside participants. There is similar uncertainty in identifying the assets that are available in the stressed entities. The IUs were intended to have solved these problems, but the IUs have not materialised. Many financial and non-financial firms have expended resources on developing bids, only to face failure for unreasonable reasons such as a deviation from the process defined in the law. This has generated reduced interest from prospective participants. In numerous recent experiences, the IRP seems to obtain only one or two bids. Many private equity funds or large listed companies have seen the difficulties of the IBC and made a conscious call to avoid IRP participation. We are still at the early stages of a process where new financial firms such as private equity funds have successfully completed a stressed asset transaction. After such experience builds up, dedicated stressed asset funds come about and succeed, and then a great wave of capital comes in. This process is still many years away, given the paucity of credible outcomes so far. A recurrent theme disrupting a smooth path towards easier participation and higher certainty of outcomes is a lack of abundant, commonly available data. Defaulting firms, lenders, IPs, IBBI and NCLT have disparate facts about transactions, and systems for dissemination do not yet exist to bring these all together. The few initiatives on data release tend towards being practitioner oriented: e.g. the user has to supply a case docket number. There are no public systems that release machine readable data-sets that can be used for research. The BLRC design for the bankruptcy process was based on a central assumption of improved access to information. This is a missing piece of infrastructure in the evolving IBC ecosystem. Where is data for the working of the Code coming from? The most readily and consistently accessible source of such information is the set of orders that are issued by the NCLT at various stages that an admitted case goes through in the process towards resolution. The data-set of cases collated in the FRG IBC dataset is collated after analysing the cases with orders posted at the NCLT website about admission or dismissal into the IRP. The second source of information is a similar collection of orders IBBI website and information derived from these orders in the IBBI newsletters. The data dissemination systems are not perfectly synchronised yet. There are gaps observed between the derived data in the IBBI newsletters compared to the source NCLT orders. For listed companies, the core principle of securities law is that all information that shapes the thinking of speculative traders should be disclosed rapidly to the market. The existing principles-based SEBI LODR correctly embeds this principle. But today, neither defaulting listed companies nor listed lenders are disclosing default events, at what stage of the resolution process they are at in the IBC, the details of chosen resolution plan, etc. (Shah and Zaveri, 2018). In such an environment, there is little published research on the Indian bankruptcy reform. Initiatives like Chatterjee et. al. (2018), where the authors hand-construct a data-set and analyse it, are valuable but rare. Given the lack of data, the field is dominated by anecdote, practitioner experience and media coverage. Decision making by practitioners and policy makers tends to pursue outliers. While such seat of the pants thinking does generate certain self-correcting mechanisms, the pace of learning is inefficient. Sengupta and Sharma, 2018, have built an annotated reading list which pulls together the extant literature. A lot more is required by way of data and research, to strengthen this literature. The Bankruptcy Legislative Reforms Committee (BLRC) is explicit on the purpose of the bankruptcy code: it is to achieve a rapid resolution. Whether this takes the form of debt restructuring, enterprise restructuring, or enterprise liquidation is not important. The key point is to rapidly resolve the enterprise failure that is visible at default, and to release capital. In recent months, we see a return to the old rhetoric of SICA and BIFR, where the desired outcome was the continued survival of the firm, and that there are persons other than the committee of creditors who should have a say in the commercial decisions that the law put in the hands of this committee. The term `stakeholders' is being used a lot. The judiciary, for instance, is assuming roles in deciding who is eligible to be a resolution applicant, is demanding progress reports during the resolution phase, is deciding whether fresh bids need to be submitted and is even providing a fresh opportunity at revisiting resolution proposals even after the expiry of 270 days. This is antithetic to the concept of bankruptcy of firms. If such ideas gather momentum, they could potentially feed into the future decisions of judges, regulatory staff or law makers. This would derail the 2016 attempt at Indian bankruptcy reform. The essence of a well functioning bankruptcy process is that the only focus of the committee of creditors should be upon their own financial performance. There should be no deviation from this ethos of a market-based economy. The Indian bankruptcy reforms, unlike in most other countries, have been developed top down rather than bottom up. The bankruptcy process requires an institutional infrastructure: the law, IBBI, subordinate legislation, IPAs, IPs, IUs, organisational capabilities in lenders, a wide pool of buyers. The skills and institutions that ought to have emerged out of the needs of financiers and enterprises, have been forced into being by creating them by law. In two years since the start of the reforms, institutions that have a well-defined role in the process of insolvency resolution have been rapidly developed and deployed to carry out their tasks (the regulator, the adjudicator and the insolvency professional). Those institutions that can be substituted for are yet to get the stimulus and support for development (IPA, IUs). Into this fragile, relatively unproven institutional infrastructure, when large cases were placed, we engaged in premature load bearing (Shah, 2018). As a consequence, only five of the 40 large cases have emerged from the IBC process. This yet-nascent system continues to grapple with delivering the equilibrium that the law was created to deliver. We are still at the early stages of revelation of the Indian corporate credit crisis. There is a large pool of distressed companies in India (Shah and Sinha, 2018), which will start to trickle into the bankruptcy process, when private negotiations with financial or operational creditors break down. The bankruptcy reform has yielded valuable gains in the behaviour of borrowers, both towards financial creditors and towards operational creditors. One hard political economy problem -- of establishing the apparatus through which the divine right of promoters is questioned -- has been achieved. But a bankruptcy process which reliably goes from a default to a solution within six to nine months remains elusive. The way forward lies in building data-sets and knowledge, and high quality policy teams, which will carry this work program forward on all the multiple fronts described above, both within the IBBI and outside of it. As with many other parts of Indian economic reform, the centre of the puzzle lies in establishing feedback loops, from evidence to research to policy. We thank Josh Felman, Sumant Batra, Varun Marwah, Gausia Shaikh, Anjali Sharma and Rajeswari Sengupta for useful discussions. We thank all participants at the IBBI-IGIDR-FICCI Insolvency and bankruptcy reforms workshop, the Insol India 2018 conference, the IBBI-IGIDR Insolvency and bankruptcy reforms conference and the EMF 2018 for shaping the thinking. Chatterjee et. al., 2018. Watching India's insolvency reforms: a new dataset of insolvency cases, Sreyan Chatterjee, Gausia Shaikh and Bhargavi Zaveri, National Law School of India Review, September 2018. Choudhary, 2018. Insolvency and Bankruptcy Code -- Role of Promoters in Resolution Process, S.G Choudhary, Business Economics, January 2, 2018. Datta and Sengupta, 2017. Commercial wisdom to judicial discretion: NCLT reorients IBC, Pratik Datta and Rajeswari Sengupta, The Leap Blog, December 13, 2017. Doshi, 2018. IBC: Why Resolution Plans Are Unsuited To An Auction According To India's Insolvency Regulator IBBI's Sahoo, Menaka Doshi, Bloomberg Quint, May 1, 2018. Feibelman, 2018. A Limiting Principle for the NCLT's New Powers Under the IBC, Adam Feibelman, The Leap Blog, August 1, 2018. Feibelman and Sane, 2017. Don't rush to ban promoters from the IBC process, Adam Feibelman and Renuka Sane, The Leap Blog, November 17, 2017. Khurana, 2017. Pieces of a complex solution: Insolvency and Bankruptcy Code, Reshmi Khurana, The Hindu, June 28, 2017. Lavi, 2018. A code for the broke, Mohan Lavi, The Hindu, March 28, 2018. Regy, 2017. RBI's proposal for a Public Credit Registry, Prasanth Regy, The Leap Blog, August 2, 2017. Roy, et. al, 2018. Building State capacity for regulation in India by Shubho Roy, Ajay Shah, B. N. Srikrishna and Somasekhar Sundaresan. In Devesh Kapur and Madhav Khosla (eds. ), "Regulation in India: Design, Capacity, Performance" (Forthcoming, 2019). Oxford: Hart Publishing. Sengupta and Sharma, 2018. An annotated reading list on the Indian bankruptcy reform, 2018, Rajeswari Sengupta and Anjali Sharma, The Leap Blog, August 14, 2018. Sengupta and Sharma, 2017. Understanding the recent IBC (Amendment) Ordinance, 2017, Rajeswari Sengupta and Anjali Sharma, The Leap Blog, December 7, 2017. Shah, 2014. Have Indian banks been underpricing corporate loans?, Ajay Shah, The Leap Blog, December 7, 2014. Shah, 2018. Sequencing issues in building jurisprudence: the problems of large bankruptcy cases, Ajay Shah, The Leap Blog, July 7, 2018. Shah, 2018. Concerns about the Indian bankruptcy reform, Ajay Shah, The Leap Blog, March 25, 2018. Shah, 2017. What is the right role for promoters in the bankruptcy process?, Ajay Shah, The Leap Blog, December 9, 2017. Shah, Sinha, 2018. Credit stress in large Indian firms, Ajay Shah and Pramod Sinha, The Leap Blog, November 21, 2018. Shah, Thomas, 2017. The Indian bankruptcy reform: The state of the art, 2017, Ajay Shah and Susan Thomas, The Leap Blog, July 13, 2017. Shah, Thomas, 2016. Indian bankruptcy reforms: Where we are and where we go next, Ajay Shah and Susan Thomas, The Leap Blog, May 18, 2016. Shah, Zaveri, 2018. Disclosure of default: The present SEBI disclosure regulation is adequate, Ajay Shah and Bhargavi Zaveri, The Leap Blog, January 11, 2018. Shrivastava, 2018. Kidnappers, Angry Workers Plague A $210 Billion Debt Cleanup, Bhuma Shrivastava, Bloomberg Quint, Jul 27, 2018. Zaveri, 2018. The Centre's approach to Insolvency and Bankruptcy Code has costs, Bhargavi Zaveri, Mint, June 14, 2018. The primary input that goes into an infrastructure project is money. In the case of the Delhi Metro, cost estimates run to Rs.5.52 Billion per km for the underground stretches and Rs.2 Billion per km for the over-ground stretches. The construction cost does not include the cost of land, which the government provides at a subsidised rate. Turning to the revenues, the arithmetic is clear. The revenue of Delhi Metro comes from the price per ride and the number of rides. To fix intuition, suppose we spend Rs.100 on an asset. Suppose the capital requires annual payments of Rs.10 per year. The infrastructure asset has to then generate at least Rs.10 of cash per year, after paying for the (small) running costs. This cash can come about in many ways, e.g. sell 1 ticket at Rs.10 or sell 10 tickets at Rs.1, and so on. The cost of capital in India is relatively high, given the presence of high macro/financial risk and a closed capital account. The annual cost of servicing the debt and equity capital, that goes into such projects, will be higher than is the case elsewhere in the world. The costs of building an urban metro system in India are similar to those seen elsewhere in the world. But the same infrastructure asset has to generate a higher revenue stream in India given a higher cost of capital. This means that the user charge or the intensity of use, or both, have to be higher in India. Hence, to think about the viability of the Delhi Metro, we have to examine the extent to which it beats global benchmarks in user charges or intensity of use or both. As the graph above shows, Delhi Metro has one of the lowest user charges in the world, when compared with other large metro systems. So we're not getting through on this one. We could just look at the number of rides in the Delhi Metro. Matters become a little more complicated for international comparisons, as the number of rides varies (slightly) with the length of the metro system. Bigger metro systems get somewhat more rides. To compare apples with apples, we look at how Delhi Metro should have fared in the context of these relationships, as observed worldwide. As the graph above shows, on this metric also, the Delhi Metro fares poorly. Delhi Metro is out of line when compared with the relationship seen worldwide. In this graph, the size of the bubble is proportional to total annual rides. Mumbai's ancient train system is faring well in translating kilometres of track into rides. The old Kolkata Metro also does a pretty good job in generating rides per km of track. But Delhi is not. The cost of a metro system in many big cities of the world is similar. The dominant element of this cost is the cost of capital. This is a more significant barrier in India, as the cost of capital is higher in India when compared with most large countries. To make ends meet, a metro system has to achieve the required cash flow by having an adequate user charge multiplied by the number of rides. In Delhi Metro, we are faring poorly on both counts: We don't have an adequate user charge, and we don't have the required number of rides. As the graph above shows, Delhi fares poorly on both Rides per Km per Year and the average price charged for a commute. The size of the bubble represents the size of the metro system. Suppose we treat Shanghai as a benchmark. Their charge is similar to that in Delhi, but they get 5.49 million rides per km of track against Delhi's 3.41. There is a gap of about 60%. How could this gap be closed by holding prices intact? Last year, Delhi's metro system was 296 km long. Delhi would need to get 615.68 million more rides per year without increasing track length, to catch up with Shanghai. That is a 60% rise from Delhi's 2017 ridership of 1007.9 million rides. Conversely, to obtain the same revenue per km of track, Delhi needs to charge 60% more per ticket. This seems far more feasible. As Delhi adds more lines next year, the denominator will grow. This will translate into a bigger challenge in terms of obtaining the requisite number of rides. We could argue that Delhi Metro is all about positive externalities and that we should not be so worried about the lack of revenues. We can then use other means like taxes to pay for the system. In this vision, the essence of urban infrastructure lies in promoting dense interactions between residents. This is measured by counting the rides per capita. A metro system is inducing large positive externalities if it achieves high values of rides per capita per year. As the evidence above shows, Delhi Metro fares poorly on the rides per capita per year. Delhi is not a small metro system. It now ranks on amongst the top ten metro systems. As the graph shows, in such large systems, the rides per capita should be higher, as the metro network covers the city better. For an example, Delhi and Madrid are both at about 200 kilometres of line. But in Delhi, there are 25 rides per person per year, while Madrid is at about 100. We are about 4 times worse than we ought to be. To justify infrastructure assets such as Delhi Metro, we in India have to find exceptionally large user charges, given the difficulties of macro/finance policy which impose an elevated cost of capital. Or, to the extent that the direct revenues are inadequate, we have to justify the expenditure based on an externalities argument. Delhi Metro is faring poorly on all three fronts. The cost per ride is low, i.e. the user charge is inadequate. The number of rides per year is low. The intensity of usage is low. We have a problem. We conjecture that part of the problem may lie not in Delhi Metro but in Delhi's urban planning. Delhi is a vertically challenged city, with severe restrictions on the number of floors a person can build. This FSI restriction creates large areas of low-density housing. For example, the IIT Delhi Metro Station is bound by IIT Delhi on one side and the Green Belt on the other. IIT Delhi has a student population of less than 8,000 and the Green Belt is entirely uninhabited for a few kilometres. In effect, the IIT Metro Station does not have a catchment area of an adequate number of potential customers. The authors would like to thank Vimal Balasubramaniam, Devendra Damle, Ashim Kapoor, and Shalini Mittal for valuable contributions. The candidates should demonstrate the ability for analytical thinking, strong qualitative and quantitative skills, and excellent writing skills. Two years of work experience is desirable. The office functions on free and open source softwares like Linux, LaTeX, R. While previous experience in these softwares is not essential, the person will be required to learn and use them for their work. He/she must be willing to adapt to technology, work long hours, and deliver quality products within defined timelines. Support research in law, economics and public policy. Work with government institutions, including government departments, regulators, etc. Manage and analyse large datasets related to health. Build devices for measurement of weather, air quality, mosquitoes, etc. Write articles, blogs and research papers. The candidate will be offered a competitive salary depending on his/her qualifications and experience. The subject line of your email should be "Health recruitment: Policy/Economics/Programmer." Please mention one description among Policy, Economics and Programmer in the subject. NIPFP is a centre for research in public economics and policy. Founded in 1976, the institute undertakes research, policy advocacy and capacity building in areas related to public economics. For more information, please see here. The National Institute of Public Finance and Policy (NIPFP) is looking to hire researchers interested in the technology policy field, on a full-time basis. In the Technology Policy group at NIPFP, we aspire to understand cutting edge issues in the field, develop novel ideas and insights, and contribute to the policy process. While our aspirations extend to a broad array of issues in the overall landscape of technology policy, at present, our work is primarily in telecom policy, privacy, open data, open APIs, open source, RegTech, distributed ledger and crypto-currencies, and competition policy. Smriti Parsheera, A gendered perspective on artificial intelligence, November, 2018. Rishab Bailey, Vrinda Bhandari, Smriti Parsheera and Faiza Rahman, Response to the draft Personal Data Protection Bill, 2018, October, 2018. Rishab Bailey and Smriti Parsheera, Data localisation in India: Questioning the means and ends, October, 2018. Rishab Bailey, Smriti Parsheera, Faiza Rahman and Renuka Sane, Disclosures in privacy policies: Does notice and consent work?, October, 2018. Smriti Parsheera, Challenges of Competition and Regulation in the Telecom Sector, Economic and Political Weekly, Vol. 53, Issue 38, 22 September 2018. Smriti Parsheera, Net Neutrality in India: Sighting the Finish Line, Economic and Political Weekly, Vol. 53, Issue 25, 23 June 2018. Suyash Rai, Dhiraj Muttreja, Sudipto Banerjee and Mayank Mishra, The Economics of Releasing the V-band and E-band Spectrum in India, April 2018. Devendra Damle and Shubho Ray, Estimating the impact of the draft drone regulations , March 2018. Smriti Parsheera, CCI's order against Google: infant steps or a coming-of-age moment?, LEAP blog, February 22, 2018. Submissions to the Justice Srikrishna Committee's White Paper on Data Protection, January, 2018. NIPFP is an exciting workplace where you will be surrounded by interesting people. The remuneration will be commensurate with the candidate's experience and will be comparable with what is found in other research institutions. You must have a Masters degree, two years of work experience, and very strong written and spoken English. You must have a background in science/engineering/technology, public economics or public policy. Keen and demonstrated knowledge in areas relating to the frontiers of science and technology is a must. by Ajay Shah and Pramod Sinha. Do not rely on bank information. This evidence is not filtered through the difficulties of banking regulation. Whether a bank classified Kingfisher Airlines as an NPA or not, we can see credit stress in the financial statements of Kingfisher Airlines. Look beyond banks. Banks are not the only financial lenders to the non-financial firms. As an example, bank-centric thinking is not useful in understanding runs on mutual funds. When there is stress in a borrower, this impacts not just on banks but on all lenders. Pulling together information about stressed borrowers helps us see the difficulties of lenders, on a financial system scale, and not just in banks. Micro-prudential considerations. The stressed firms face likely defaults. The debt of such firms is likely to be worth less than book value. Under sound micro-prudential regulation, banks and other lenders should mark down these assets, even if no default has taken place. The extent of stress, as seen here, gives us insights into the fragility of banks and other lenders. The bankruptcy process, the distressed debt industry. There is a new world opening up in India, of distressed firm transactions and the bankruptcy process. We will see the empirical contours of this industry, and the bankruptcy process, by examining the state of credit stress in the non-financial firms. A drag on growth. A firm that is in a state of credit stress is likely to face difficulties meeting payments to creditors. It might often be liquidity constrained, and may struggle to obtain cash to pay its suppliers. The mind space of the leadership of such a firm is likely to be absorbed in the struggle for survival. Such firms are unlikely to fare well on growth through increasing the resources utilised or through increased productivity. To understand what is coming in Indian macroeconomics, we should look at the non-financial firms and their balance sheet difficulties. The interest cover ratio is defined as PBIT/interest. If a firm has to make interest payments of 100, and if its profit before interest and taxes is 150, then its interest cover ratio ("ICR") is 1.5. Such a firm has the 100 required to pay interest in the year, but there may be a task in terms of juggling the dates on which interest has to be paid versus the dates on which the business produces cash. And, such a firm is left with just 50 after paying interest, which can be used for debt repayment and the regular capital expenditures required for the upkeep of the business. A good thumb rule which identifies a firm in a state of stress at time $t$ is: The firm has ICR$ < 1.5$ in year $t$ and in year $t-1$. This avoids the false positive of a firm which only hits ICR$<1.5$ for one year. A `stressed firm', by this definition, is not necessarily one that has defaulted (and is thus eligible for the bankruptcy code), and it is not necessarily one that is classified as a non-performing asset by RBI's rules of recognition. We would, however, suggest that a firm with two consecutive years at an ICR of below 1.5 is under stress, has an enlarged risk of default, and has a management team that is absorbed in dealing with this stress. We study all the non-financial firms in the CMIE database. At each year, we isolate the firms which are observed for two consecutive years. Some additional sanity checks are applied. Through this, we are able to construct two sets at each point in time: The set of all firms observed and the subset of this, which is the stressed firms. Here are some counts of the firms in the two sets. it, where information for a larger number of firms has trickled into the CMIE database. In this last year, we see 2,573 non-financial firms in the database, where the ICR was worse than 1.5 in both 2015-16 and 2016-17. This shows that the sum of the balance sheet size for all the 6,687 firms for 2016-17 was Rs.77.24 trillion. Of this, Rs.29.79 trillion was in the 2,573 stressed firms. Totally, borrowing of Rs.27.59 trillion was visible. This is small when compared with the total assets of these firms of Rs.77.24 trillion. Of this borrowing, Rs.15.58 trillion was in the stressed firms. Finally, we are able to see Rs.14.94 trillion of borrowing from banks, in this sample of 6,687 firms, in 2016-17. Of this, Rs.8.87 trillion was in the stressed firms. 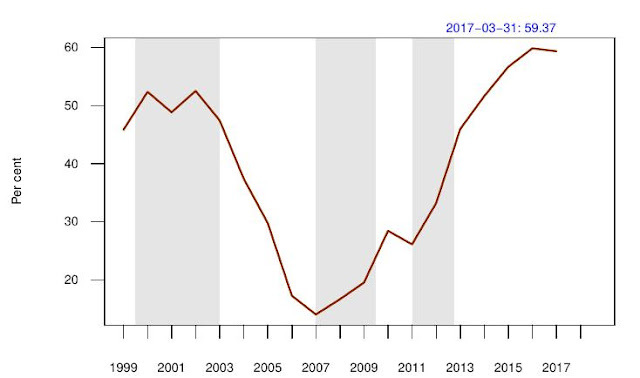 How has credit stress evolved over time? We are able to do these calculations for all years from 1998-99 onwards. We will express the time-series evidence using confusingly similar graphs, all of which produce important stylised facts for our understanding of the economy. The health of banks is related to the health of their borrowers. Hence, in the graph above, we compare the sum of bank credit to stressed firms (in our sample) against the sum of bank credit to all firms (in our sample). 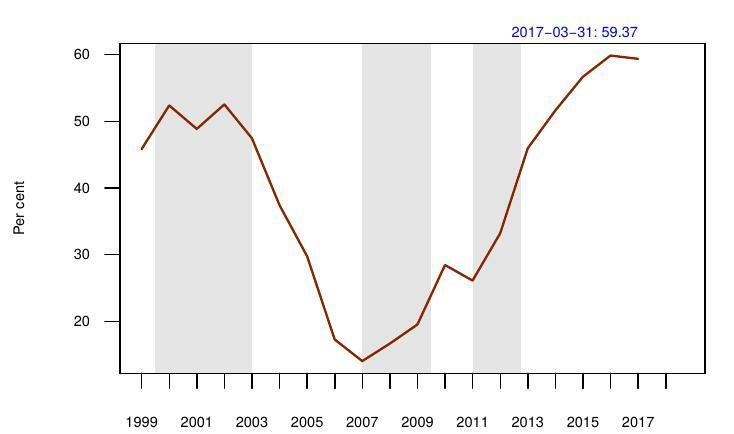 The business cycle is clearly visible here. In the last tough downturn, 2000-2003, this ratio was at about 50%. That is, about half of the bank borrowing seen in the CMIE database was in stressed firms. This ratio dropped all the way to about 15% in 2007. It climbed steadily thereafter and is now at about 60%. There is a tiny gain in 2016-17 when compared with the previous year. In the last recession, this measure improved through the recovery of the economy. Firm exit took place through the sluggish traditional ways. When the bankruptcy reform resolves or liquidates a large volume of stressed firms, this will deliver improvements in this measure. To the extent that the bankruptcy reform works, we may expect the next recovery to proceed faster than the last one, where it took five years of a powerful expansion to get from about 50% to about 15%. 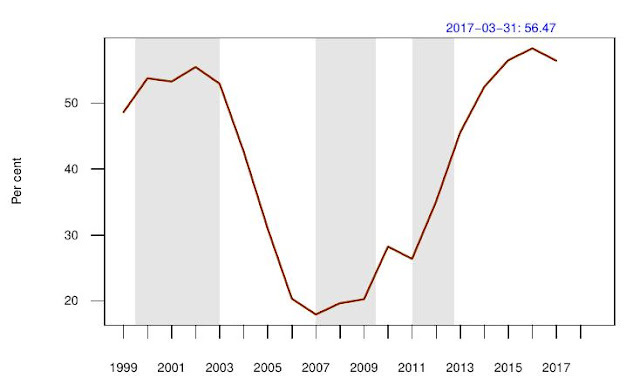 The last business cycle downturn got to values of above 50%, there was a great decline to about 20%, and then it has risen to about 55%, with a slight improvement in 2016-17. There is considerable balance sheet stress. In the latest year, the aggregate balance sheet size of the stressed firms -- observed in the CMIE database -- was Rs.30 trillion. The stressed firms had Rs.15.6 trillion in borrowings of which Rs.9 trillion was from banks. This has implications in other parts of finance, beyond banking. Bank debt in stressed firms is about 60% of total bank debt seen in the sample. Similarly, the borrowing by stressed firms is about 55% of all borrowing in the sample. Under sound micro-prudential regulation, asset-based lenders would mark down these assets based on the price at which the loan/bond could be sold on the market. In the conventional wisdom, there is about Rs.10 trillion of bad debt on the balance sheet of banks. Our analysis shows that in the 6,687 large non-financial firms, where Rs.15 trillion of bank debt is located, we see 2,573 stressed firms with Rs.9 trillion of bank debt. The 2,573 stressed firms that we see in this sample, alone, account for 11.4% of the overall bank debt ("non-food credit") in the economy. The stressed firms are about 40% of the overall corporate balance sheet. These firms are likely to fare poorly in investing or in productivity growth, and are thus a drag upon overall economic growth. It is likely that many of these stressed firms will be sold, or go into the bankruptcy process. There is a substantial task ahead, in terms of resolving these firms and paying for the losses experienced. These 2,573 firms are the happy hunting ground for this new industry. This process of resolution is central to India's economic recovery. There is much value in understanding the balance sheet stress in the economy using such methods. 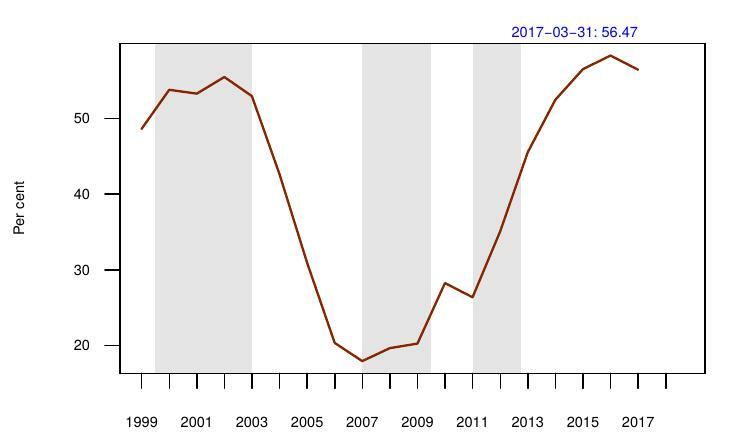 We obtain insights into difficulties of the financial system going beyond a bank-centric view, we get a view of the new distressed debt industry, and we get insights into the drag on GDP growth that the stressed firms represent. The authors are researchers at NIPFP.